Forestry students from Stephen F. Austin State University's Arthur Temple College of Forestry and Agriculture and representatives from the Texas A&M Forest Service led approximately 1,000 volunteers through proper planting techniques and tree care during the City of Tyler's Arbor Day Celebration held Jan. 27. 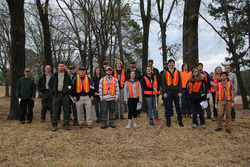 Pictured are SFA participants, wearing orange vests, as well as staff members of the Texas A&M Forest Service. NACOGDOCHES, Texas - Stephen F. Austin State University urban forestry students worked alongside representatives from the Texas A&M Forest Service on Jan. 27 to assist volunteers with planting more than 100 trees representing 46 different species in Tyler. The event was part of the City of Tyler's Arbor Day Celebration and drew close to 1,000 volunteers from throughout the community. "I was really impressed with the community involvement at this Arbor Day event," said Tara Nathanson, urban forestry junior and president of the Student Society of Arboriculture at SFA. "I was glad to be able to teach adults and children how to properly plant trees so they can have that knowledge for the future." Cody Goldman, arborist for the City of Tyler, said that the participation and guidance provided by team leaders resulted in a 95-percent survival rate of trees planted during last year's event.